Differences in ethical ideology are thought to influence individuals' reasoning about moral issues (Forsyth and Nye, 1990; Forsyth, 1992). To date, relatively little research has addressed this proposition in terms of business-related ethical issues. In the present study, four groups, representing four distinct ethical ideologies, were created based on the two dimensions of the Ethical Position Questionnaire (idealism and relativism), as posited by Forsyth (1980). 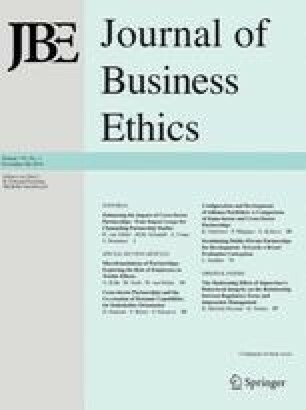 The ethical judgments of individuals regarding several business-related issues varied, depending upon their ethical ideology. Tim Barnett is Assistant Professor of Management at Louisiana Tech University. He has published in such journals asPersonnel Psychology, theJournal of Business Research, andHuman Relations. His research interests include ethical decision making and ethical issues in HRM. Ken Bass is Assistant Professor of Management at East Carolina State University. He has articles published in several journals, including theJournal of Personal Selling and Sales Management. His research interests include ethical decision making, ethical strategy, and methodology. Gene Brown is Associate Professor Marketing at Louisiana Tech University. He is published in such journals as theJournal of Retailing, the Journal of the Academy of Marketing Science, theJournal of Business Research, Psychology and Marketing, and Industrial Marketing Management. His main interests include personal selling, retailing, ethics, and methodology.